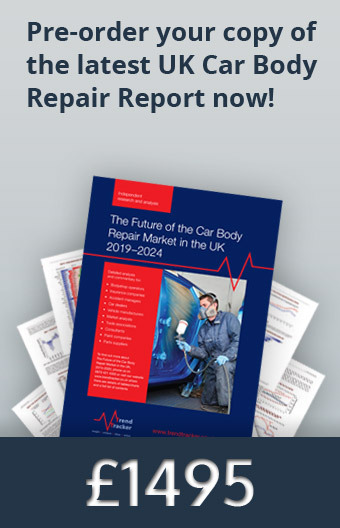 Trend Tracker Limited is a business that is dedicated to providing accurate and informed automotive industry research, specifically concentrating on the UK car body repair and the UK motor insurance sectors, including the associated supply chains. Trend Tracker is a well-established business – since 2003 – during which time we have undertaken bespoke client studies and has published our own market reports. We differentiate ourselves from the majority of other research businesses as we have over 40-years of automotive industry experience, and thus we have a thorough understanding of the industry that we report upon. Our success is born out of providing informative and insightful market reports by gathering and analysing exclusive data. In turn, our customers’ benefit from a unique insight into the markets we serve. As we have many years’ experience in delivering generic and bespoke services, we welcome project work – large or small – and look forward to meeting your needs! If you are interested in what Trend Tracker has to offer, wish to become involved, or indeed have any suggestions for how we can improve our service, please don’t hesitate to contact us.